WordPress 2.7 is now available for Download. Interestingly though nothing is mentioned on the Official WordPress Blog, but seems like WordPress 2.7 is finally released. You can download WordPress 2.7 from the Official WordPress Download Page. Wordpress 2.7 has made it to the world. This has come pretty soon given the fact that WordPress released RC2 for WordPress 2.7 two days back. [Update] WordPress.org homepage has the information about the release. I was indeed referring to the WordPress Official Blog which somehow didnt have the information while i was typing the post. The info is now up on the wordpress blog. Seems like WordPress 2.7 is not yet ready for the world. WordPress has now released the WordPress 2.7 RC2 after it released WordPress 2.7 RC1 few days back. You can download WordPress 2.7 RC 2 by clicking here. Seems like WordPress is on a roll. Yesterday they released the WordPress 2.7 Release Candidate 1 and now they have another news for us. Wordress.com users will get the WordPress 2.7 version rolled out tomorrow. i.e. Thursday. As promised, here is the advance notice that WordPress 2.7 is coming to WordPress.com, and will go live on Thursday, December 4, 2008 at 8pm Eastern Time. WordPress has released the Candidate 1 release for WordPress 2.7. Seems like wordpress is moving real fast with the release of 2.7 which is scheduled to happen soon. Also, if you are still on the older WordPress 2.x.x , its time you get a copy of WordPress 2.6.5 which was released a few days back. WordPress has released the latest version to the existing 2.6.3 version. The latest release has fixes for a couple of security issues which only affects IP-based virtual servers running on Apache 2.x. The security issue is an XSS exploit discovered by Jeremias Reith that fortunately only affects IP-based virtual servers running on Apache 2.x. If you are interested only in the security fix, copy wp-includes/feed.php andwp-includes/version.php from the 2.6.5 release package. 2.6.5 contains three other small fixes in addition to the XSS fix. The first prevents accidentally saving post meta information to a revision. The second prevents XML-RPC from fetching incorrect post types. The third adds some user ID sanitization during bulk delete requests. For a list of changed files, consult the full changeset between 2.6.3 and 2.6.5. Also, interestingly WordPress has deliberately not released the WordPress 2.6.4 release to avoid confusion with a fake 2.6.4 release that made the rounds a few days back. Please note WordPress doesn’t have a 2.6.4 version and if you happen to be running one of that, you better abandon it as soon as possible. WordPress also says, there is no 2.6.4 version and there will never be a WordPress 2.6.4 version. 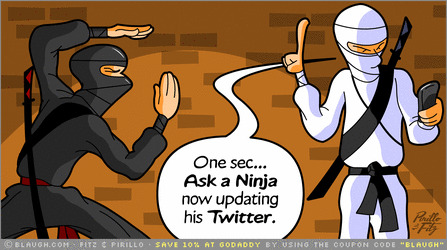 You all already know what twitter is all about and what all interesting applications are built on twitter. Its time for some interesting cartoon visuals on Twitter. Clearly depicts the way Twitter has taken on our lives. Have fun and keep Twittering. If you are a blogger, who keeps looking for fodder for the next post(s), Google Alerts can bring quite a relief. Google Alerts can help you keep updated with information of interest. All you need to do is create an alert for that information. 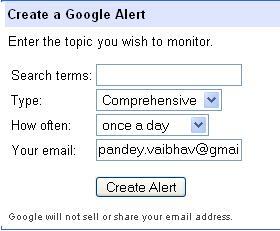 Google Alerts currently offers 6 variations of alerts – ‘News’, ‘Web’, ‘Blogs’, ‘Comprehensive’, ‘Video’ and ‘Groups’. A ‘Groups’ alert is an email aggregate of new posts that contain the search terms of your choice and appear in the top fifty results of your Google Groups search. 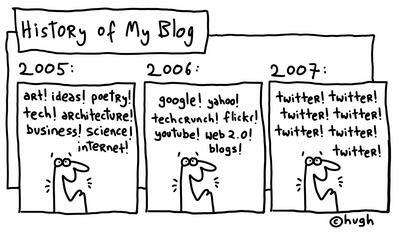 Lets assume you are a blogger who writes about various events happening in a particular city, for e.g. Bangalore. You would be interested in monitoring latest information floating in the web, you can do so by creating an alert for the same in Google Alerts. Follow the steps below to create an alert for Bangalore Events. 1.) Login to Google Alerts using your Google User Id. 2.) Enter the Search terms for which you wish to create an alert. In our case, enter Bangalore Events. 3.) Select the type of Alert. In our case, we select Comprehensive. 4.) Select How-Often you wish to get the alerts. For out case, we would like to get an alert as soon as the information is available. Select as-it-happens from the drop-down. 5.) Enter the email address where you would like to get the alerts. For our case, enter your mail id. For further help on Google Alerts, visit the Google Alerts help page. Personally, I have found Google Alerts very useful. My usage of Google Alerts primarily revolves around Tech news, Links Updates etc. Do share your views on Google Alerts in the comments section. [How-to] Download any video from your favorite video website.